The Bent Oak Winery and Tasting Room host Get Bent merchandise where you can check out our apparel line, home goods, glassware, and hand-crafted products in addition to purchasing Bent Oak Wines by the bottle or case. Give the enjoyment of wine to your family, friends, and colleagues. 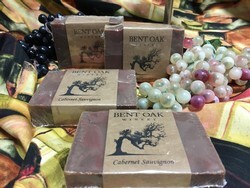 Natural hypoallergenic soap with our Cabernet Sauvignon will have you cleaned up and spiffy!